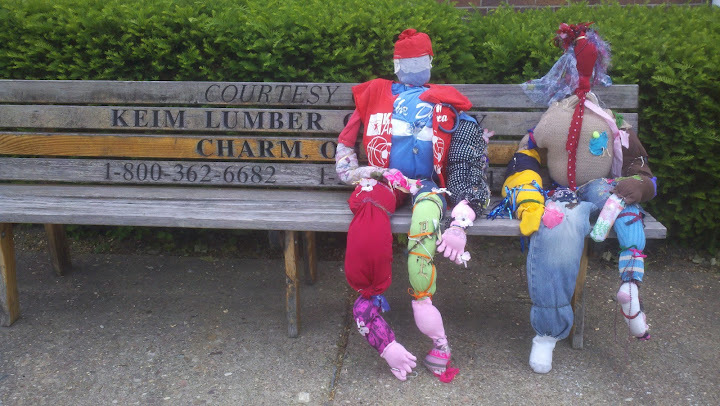 Part of the concept behind the “people” that I created during my most recent arts residency was that they would travel around Coshocton and appear in “Unexpected Places” for the month following their creation. I recently checked the Pomerene Center’s online gallery and was excited to see that they’re having a great time traveling around to all of the participating children’s schools. It’s fun to see how the project that I set in motion is continuing. There are more photos of the people and their travels on the Pomerene Center for the Arts’ website. that is a great addition to the project! What thoroughly enchanting “people”! The figures make me want to “know” them! I hope that this project gets wide publicity. Thank you for keeping us updated. What a great way to introduce children to the staying power, and impact of Art on the community.